Chipping from the side of the green or over bunkers requires your short game to be perfect, otherwise you could see your shots rise. 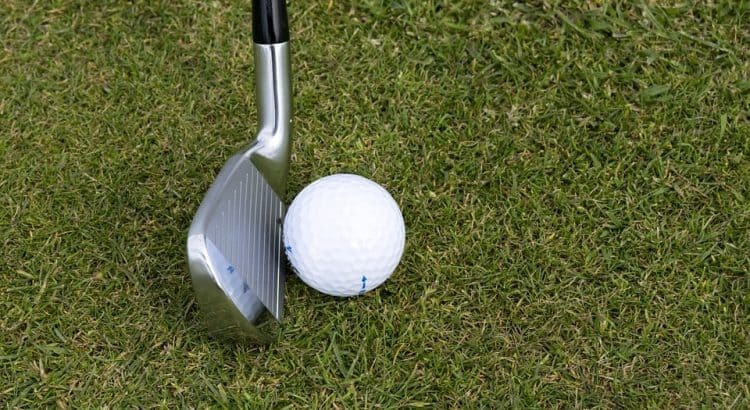 Chipping with a pitching or sand wedge requires a lot of practice on and off the course. Not every course will have a practice green and the weather may not be on your side. The alternative way to practice is to purchase a chipping target net so that you can perfect your chipping. The best chipping net for indoor and outdoor practice is the Leader Accessories Pop Up Portable Golf Chipping Net that simply pops up in seconds. It has 9 targets and will almost certainly improve your short game. Chipping nets come in a range of designs, sizes and targets with many for use indoors and outdoors. Most of the time, the indoor chipping nets are smaller, whereas the outdoor chipping nets are larger and often more sturdier with pegs dug into the ground. Some chipping nets are literally just nets that you aim to chip the ball into. Others contain multiple targets within the nets that require you to chip into certain ones with pinpoint accuracy. After trialling multiple chipping nets and researching a range on durability, price and design, below is a list of the best-chipping nets for practising. If the other chipping nets looks too easy and you feel that you are a confident golfer, try the Leader Accessories chipping net. It has 8 targets to choose from at the back and one easy target at the back for beginners. It measures at 42 inches in height, 33 inches width and 25 inches in diameter. 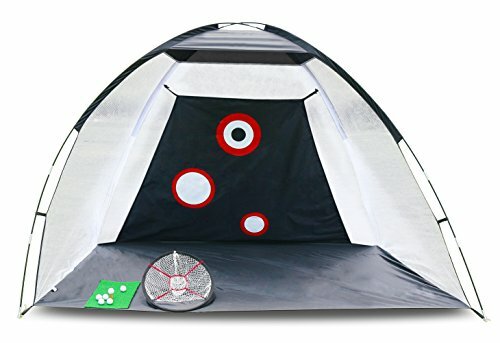 It is designed to be a “pop up” chipping net and can be setup within seconds. Included within this package are a chipping mat, hex keys, tee and 6 golf balls. The water-resistant nylon is high quality and can be used both indoors and outdoors. For windy days, you can stalk it into the ground to prevent it moving. To ensure people don’t get confused, it is primarily a chipping net and not a driving net. The Leader Accessories Advanced Chipping Net is the most expensive in the article but its the best chipping net for practicing and even included accessories. The Rukket Skee chipping net has three target areas to chip into and the dimensions stand at 20 x 25 x 20 inches. It also comes with its own storage bag so that you can carry it to wherever you want to practice chipping. 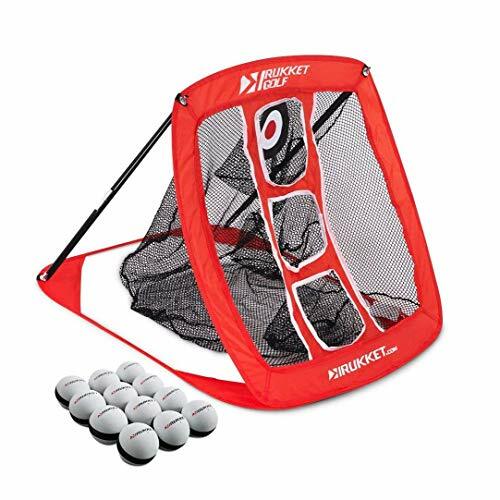 The Rukket Skee target practice golf net is great for both indoor and outdoor use and comes with hooks to dig into the ground for windy outdoor play. Unlike other chipping nets, there are not any metal poles that you need to screw into place. You simply get it out the included carrier bag and it pops into shape within seconds. You can then start chipping away to your heart’s content. Overall, if you are looking for a cheap and easy to setup chipping target net, the Rukket Skee would be the best buy. The World Of Golf Brand has developed a “Bulls-eye” style chipping net that has three different skill levels. It has a circular 23-inch diameter with three circular targets inside to practice your short game. The high-quality materials used are durable nylon netting, denier 600 and metal frames for a rigid structure. There is no need to assemble it, straight from the box you can begin to chip away at the three targets. The JEF World Of Golf net would primarily be used for outdoor use due to the size but can still be used in garages or basements. Overall, a great all-rounder that will test both beginner and professional golfers. 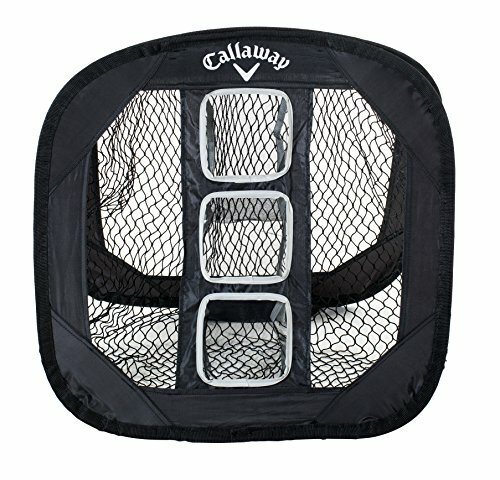 The Callaway Chip Shot Net is for those golfers who abide by the golfing brands and are not worried about paying that little extra. 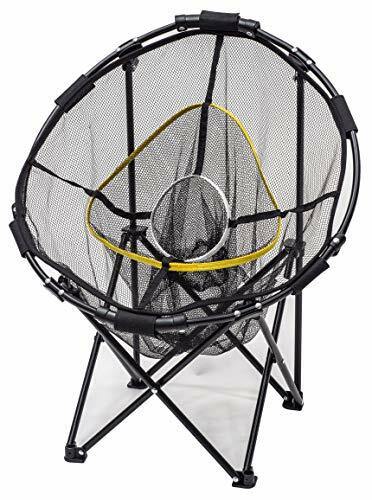 The target net is 26 by 26 inches and includes 3 separate targets to aim your shot at. As you can imagine with anything Callaway made, the material is of the highest quality and can withstand both indoor and outdoor conditions. It folds down into a portable size within seconds and can be stored securely when not in use. If every golf item you buy is Callaway, you will not be disappointed with their chipping net. If you are looking to save a little bit of money, go for the Rukket Skee but overall, they are both very similar bar the branding. Practising your short game out on the golf course can be very useful for improving your game. However, being able to practice at home by using a golf chipper net will allow you to practice when out want and wherever you want. The best golf chipping net will have various targets to shoot your ball into as well as being easy to set up and durable. We recommend that you try to avoid any that look complex to setup as this defeats the purpose of being able to set up the chipper net in second and make your life that little bit easier. All of our recommendations above are highly popular throughout the US and provide an excellent target practice to improve your chipping. If you are looking to improve your technique with other clubs, we advise that you check out the latest golf hitting net, which will take far more impact. Chipping into a target net such as the ones listed above is the best method to improve on your short game. Our favourite is the Leader Accessories Advanced Chipping Net that provides an easy chipping basket at the front but 8 targets at the back for advanced golfers. It’s not always possible to get to the golf course or the weather is too bad to play. However, by owning a high-quality chipping net, you are able to set it up indoor such as the garage and start chipping away. Deciding which is the best golf chipping net for you contain a range of factors. Firstly, you want to decide whether you want to challenge yourself with a hard basket with many targets or just one. Secondly, you will want to decide if you want a small or large chipping basket. If you are wanting a small chipping net, I would personally go for the Callaway chipping net as it is high quality, takes seconds to setup and can be stored easily. As far as chipping nets go, the FastGolf target is not the usual but more of an “umbrella” style. However, the new design is proven to be easier to visualize your intended target and more like a normal golf flag/pin. Included is a bag, which you can store the FastGolf USA Chipping Target Net into that also folds down to size very quickly. Its the tallest chipping net within this article and stands at 45 inches tall with a base footprint of 34 inches. Overall, it is one of the best indoor chipping nets you can buy. However, under strong winds, the nylon splitting the target may cause the net to move around.